Munich - From humble beginnings in Mönchengladbach to triumphing in the UEFA Champions League with Real Madrid and FC Bayern München, Jupp Heynckes has done it all - and he’s got the numbers to show it. The retired coach, who has just turned 70, clocked up 642 games as a Bundesliga coach, taking his career total - playing days included - through the staggering 1,000 top-flight assignment mark. It all began on 14 August 1965, back when a little-known 20-year-old trod the Bundesliga boards for the first time in Borussia Mönchengladbach's 1-1 draw at Borussia Neunkirchen. Heynckes went on to play a further 368 matches in Germany’s elite division before moving into coaching in 1979. Well over 30 years further down the line, he has cemented his reputation as one of the most celebrated and enduring coaches in Bundesliga history. "It shows you how the years have flown by," said Heynckes. "As a player, I would never have dreamed of it. It's a long history and I could tell you all kinds of tales." Documenting such anecdotes would certainly make for a weighty tome, and that’s even before the Mönchengladbach native swapped his boots for the tactics chart. "There were great moments and great matches," Heynckes said of his playing days, but winning the Bundesliga for the first time in 1971 remains “the most emotional moment" of a glittering career that encompassed a further three league titles and winners’ medals in the DFB Cup (1973), UEFA Cup (1975), European Championships (1972) and FIFA World Cup (1974). And with 220 goals, the vast bulk of them for Gladbach, he remains the third-highest scorer in the 50-year history of Germany’s national top flight. He has been no less successful as a coach. Heynckes made a name for himself at Bayern, guiding the club to back-to-back Bundesliga titles in 1989 and 1990, before recording what was his greatest achievement up to then at the helm of Real Madrid in 1998 as Los Blancos lifted their seventh Champions League title. 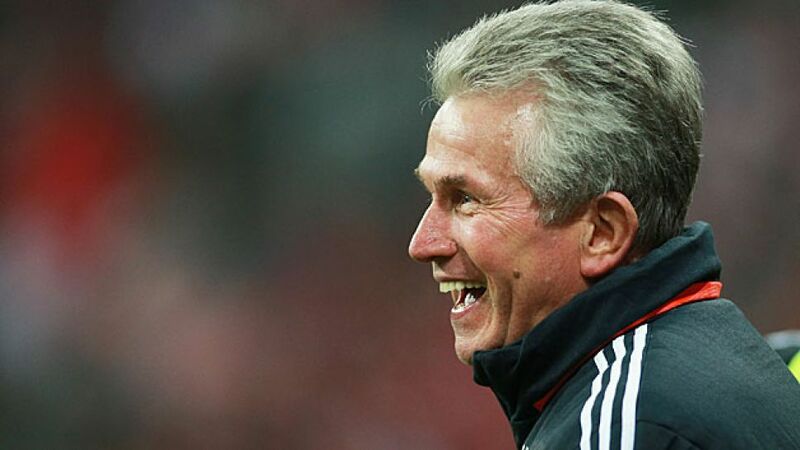 After subsequent spells with Benfica SL, Athletic Club, FC Schalke 04 and Gladbach, Heynckes took a period of time out of the game before returning to Bayern in an interim capacity following the dismissal of Jürgen Klinsmann in 2009. That brief stint whet his appetite for more and the veteran coach was soon offered a full-time post by Bayer 04 Leverkusen. "Don Jupp" continued his success story with the Werkself, leading them to fouth and second-placed finishes in the Bundesliga in his two seasons on the Rhine – enough to earn him a return to Bayern for one final hurrah in 2011. Overseeing a rare period of transition at the club, Heynckes came agonisingly close to a second Champions League crown in May 2012 as Bayern lost out on penalties in their own back yard to Premier League side Chelsea FC. They made amends a year later, though, with victory over Borussia Dortmund at Wembley taking him into an exclusive group of four coaches to have lifted European football's ultimate prize with two different clubs. 29 of Heynckes’ 321 league wins as a coach came in his final season, 2012/13, when he completed an historic treble of Bundesliga, DFB Cup and Champions League triumphs with Bayern. After that, he walked away from the game with his head held high, earning worthy recognition as the world's best coach in 2013. Now 70, bundesliga.com salutes the legend that is Jupp Heynckes.